Injury Due to a Slip and Fall Accident? Whenever you go to a place of business, you are putting your trust into the business owners and all the employees of that business. You are trusting that everyone has done their due diligence to ensure the safety of the grounds. That trust is breached when you or someone you are with gets injured as a result of negligent business practices that put the public at risk. Slip and fall injuries are one of the most common causes of injury on public property. According to the National Floor Safety Institute (NFSI), slip and fall accidents “account for over 8 million hospital emergency room visits” and represent “the leading cause of visits (21.3%)”. If you have suffered an injury from a slip and fall accident while on someone else’s property, then you are likely eligible to receive recovery for damages. Founder and principal attorney, Adam Grutzmacher, has dedicated his legal career to helping those who have been wrongfully injured. For over a decade, he has successfully litigated personal injury cases in Pennsylvania and New Jersey, helping people get back on their feet with dedication and pride. For Adam, helping those in need is the most rewarding part of his job and why he decided to get into the field of personal injury. Since opening his firm, he has built a steadfast reputation for being an aggressive litigator who forms close personal relationships with clients. This allows him to build strong, specific and detailed case plans that will give his clients the best possible chance at receiving a favorable outcome. Bone fractures. Slip and falls often result in fractured bones. Fractures most commonly occur in the clavicle area (from the pressure of your body weight falling forward) as well as the ankle, tailbone and hip bones. The report from the NFSI states that “Of all fractures from falls, hip fractures are the most serious and lead to the greatest health problems and number of deaths”. Pulled/Strained tendons and muscles. Have you ever lost your balance and reached your hand out to either steady or brace your fall? This is a subconscious reflex that is often the reason that tendons and muscles get sprained, strained and/or pulled in a slip and fall accident. This reflex could even be the cause of broken bones in the event of a fall. Traumatic brain injury. Your brain is not only protected by your skull, but also by an intricate system of bones. These bones range in size; some are robust while others are very delicate and small. When any of these bones are damaged, you are at more of a risk of traumatic brain injury as some of your brain’s protection has been compromised. This compromise leaves you more susceptible to suffering from skull fractures, contusions (bruises) and even long-term brain damage. Spine injury. Spinal cord injury settlements are typically sizable in large part because spine injuries are extensive and often require long-term treatment and rehabilitation. Spine injuries are one of the most serious types of injuries a person can suffer. Even a minor spine injury can be a major obstacle that a wrongfully injured person must work around — perhaps for a lifetime. The most common types of spine injuries include chipped vertebrae, slipped discs and even paralysis if damage to the spinal cord is extensive enough. A property owner has a certain duty of care to every patron and worker who steps foot onto the premises. When a property owner and/or his or her employees fails to provide a reasonable duty of care, they can be held liable in the event of an accident. If you have suffered any of the above or other injuries as a result of a slip and fall accident, then you could be eligible to receive compensation for damages. There are several things you can do immediately after a slip and fall accident that can either help or hurt you should you choose to pursue legal action. Not only that, but knowing what to do in the event that you or someone you were with is injured could potentially make a difference. Call 911. First and foremost, stay calm and seek medical attention if you or someone else is hurt. Provide aid to the injured person if it is not yourself, but be mindful that his or her injuries could be serious. You will want to avoid moving the injured person too much as he or she could be suffering from a spine or neck injury — moving them could render them paralyzed. You could even be held liable for worsening their injury, especially if you reside in a state that does not have “Good Samaritan” protections. Gather evidence. If you are not seriously injured, then the best thing you can do after a slip and fall accident is to extensively investigate the spot where you fell. Determine what caused the fall when possible (ie: snow, ice, leaking pipe etc.). Take several pictures of the area. Talk to any witnesses (even those that did not witness the fall, but did see the aftermath) and get their contact information — they will be useful in a premises liability case. Contact a premises liability attorney. After the accident, you will most likely be contacted by the property owner’s insurance company and/or their company attorneys very soon. It is the goal of both of these parties to resolve premises liability incidents quickly and quietly — and unfairly, more often than not. Initial offers from insurance adjusters are often a “lowball” and nowhere near enough to cover medical bills, let alone pain and suffering that the accident has caused. An experienced Philadelphia slip and fall lawyer will be able to negotiate with these parties on your behalf and ensure that your best interests are being looked after. When we are injured, enduring and recovering from that injury is often all we can focus on. This should be your focus as your health is most important. Adam has extensive knowledge of both state and federal laws and experience pertaining to premises liability and personal injury. He knows what it takes to set you on the road to recovery. Being injured is a stressful affair for anyone. If you have been injured while simply trying to enjoy yourself at the mall, restaurant or other public property, then you deserve compensation for past, present and future damages — including mental pain and suffering. Local Philadelphia slip and fall lawyer, Adam, has over 10 years of experience litigating personal injury cases for the wrongfully injured. 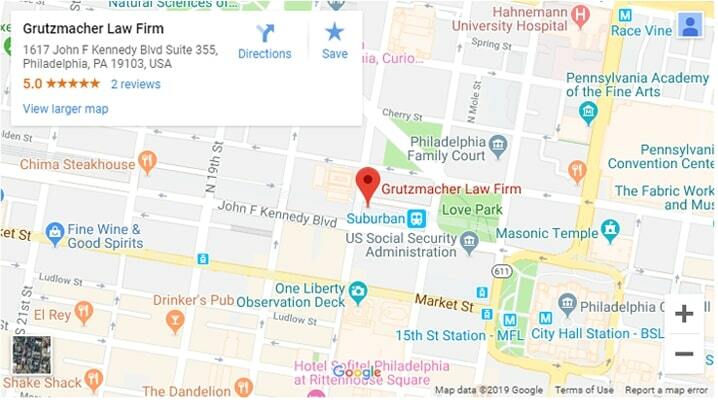 He is familiar with both Philadelphia and New Jersey court systems and laws, and will travel whenever necessary to fight vigorously for every client he represents. You do not have to make any decisions about legal representation now. Adam offers free consultations so potential clients can come in and talk over the details of their case, their legal options and rights before deciding to move forward with their premises liability claim. Contact us online or call (215) 880-1369 to see how Adam can help you today.